is it possible that the temp data from OpenWeatherMap can be implemented the same way as WU, so that it can be stored in the Extended Data (v7-v12)? Disabling main temperature v5 for all weather devices and extended parameters for openweathermap will be available soon. cheers i have added it. hopefully it starts working overnight. 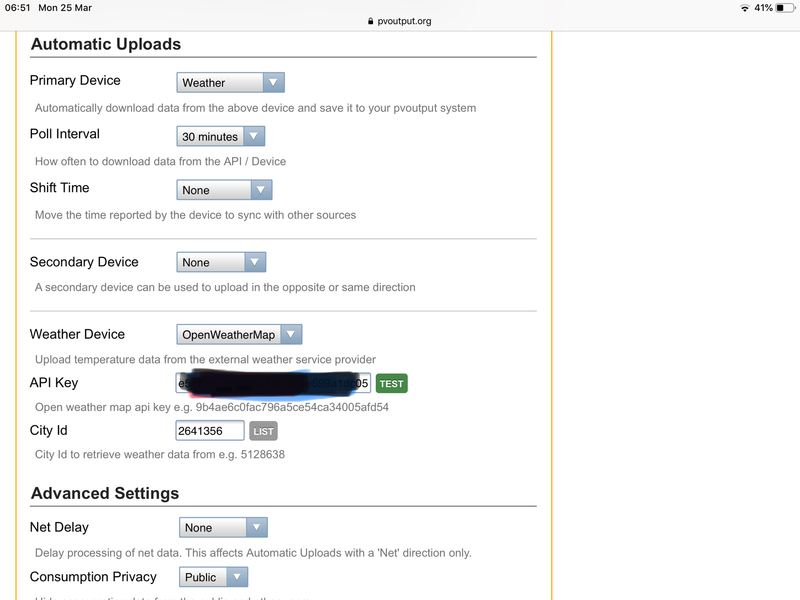 So I’ve deleted WU info in my pvoutput settings and now put my new openweather info in place. The issue I’m having is even though the free OW account api says you can have 60 requests an hour, when PV asks for my local town’s temperature every 5 minutes, it does not send it ( on average it updates every 15 minutes). So my temperature trace on my PV account cycles between displaying the town temperature and the temperature the EnviR is measuring (ie the temperature of the room that the device is located in). Does anyone know how to stop this cycling and only display the town temperature? so are you trying to display 2 temperatures on the main live page,? weather temp and room temp? the main page will only display i temp the second should have been placed by you in extender data. Cheers Jim. Yeah just trying to display OP temp only. Couldn’t give a monkeys about my house temp. Didn’t realise it only updates once every 10 mins. Any ideas how I can disable my house temp? Primary device is set as weather and the poll interval is currently set at 30mins. Jim , unfortunately I cannot switch of my house temp. I use a gizmo called an enviR which is plugged into a Rasp Pi and that sends all solar, consumption, and temp data to PVoutput. I downloaded the Pi program because I haven’t got a clue how to write code. The EnviR has a built in temp sensor, so unless I crack it open and snip the sensor, there isn’t much I can do. i use an envir with pvoutput integration service you can disable the temp in there if you want. mine isn’t showing any temps what have i done wrong. When the system was initially saved the key was still not activated on openweathermap and invalid. PVOutput will remove any invalid keys from downloads. Try saving the system again. ‘Weather’ is only used when no other device is being used. Missing my WU API feed and not (yet) owning a Wx station, I wasn’t sure this would work. However, I stumbled through OpenWeatherMap’s registration (curse multi-Captchas! ), requested an API and inserted it into my PVO settings. PVO’s ‘Test’ refused to acknowledge it, but then I read the email in my Junk folder - expect activation within a couple of hours. Would be nice if they said that on the website when you create it!!! Can’t get it to plot house temp on extended data. As soon as I implement it, I lose all data displays. Can’t get it to plot house temp on extended data. 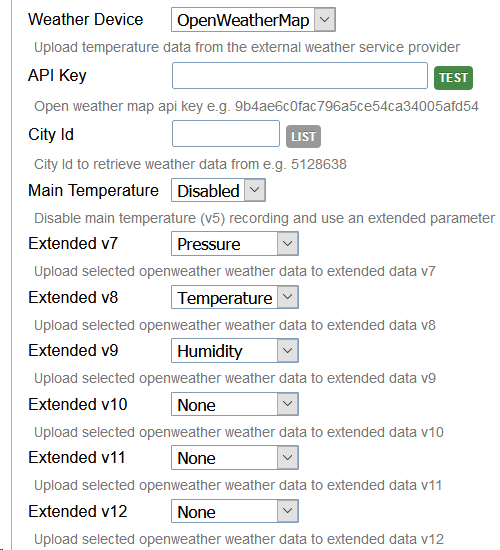 Openweathermap extended parameter options now available.